She calls herself a “truck-stop cook.” She isn’t what she would call a “chef.” She is a craftsman who has a few really good recipes. Over the years, she’s cooked these few (these happy few), receiving raves from friends and family lucky enough to partake. Over the years, she’s tinkered with each concoction, improving and perfecting her enchiladas, banana bread, beef stew, spag-bol, quiche Lorraine, cinnamon rolls, cookies, fudge, and–notably–lasagna. She’s been working on her lasagna recipe for 30 years. She measures by eye, always has sauce and cheese left over, always makes them two at a time–a large one for the feast, a smaller one to be frozen, uncooked, for later–and always, always it is wonderful, flavorful, and unlike any other lasagna I’ve ever tasted. 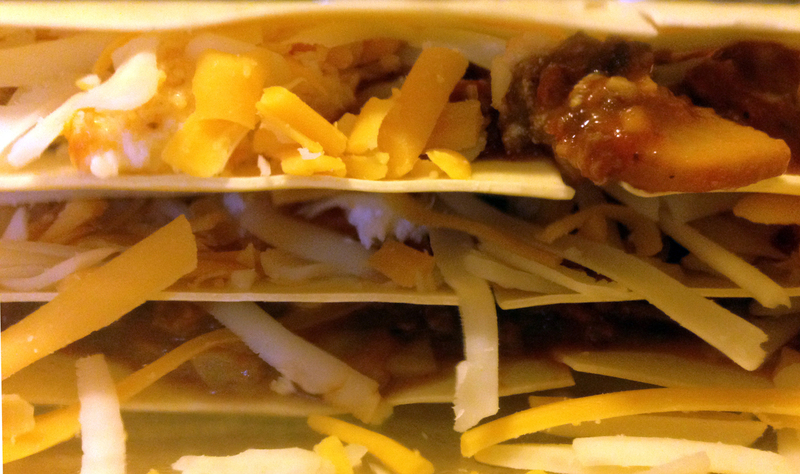 Last weekend, Ilene made her lasagna for a large gathering of friends and neighbors. The occasion was specifically to introduce her masterpiece to folks who’ve never had it before. Normally, I am her sous chef, doing all the chopping and grating, stirring and cleaning, while she swans in and casts her magic alchemy with handfuls of spice and multiple taste-tests. This time, however, I followed her around, noted her every move, measured every handful and pile she used, and weighed all the ingredients left behind. I calculated the mounds and pounds that went into each of the two mismatched pies, then got out my slide rule and conversion charts and constructed a single recipe for a 9×13″ lasagna. Last night, I tried it myself, and got Ilene’s stamp of approval. 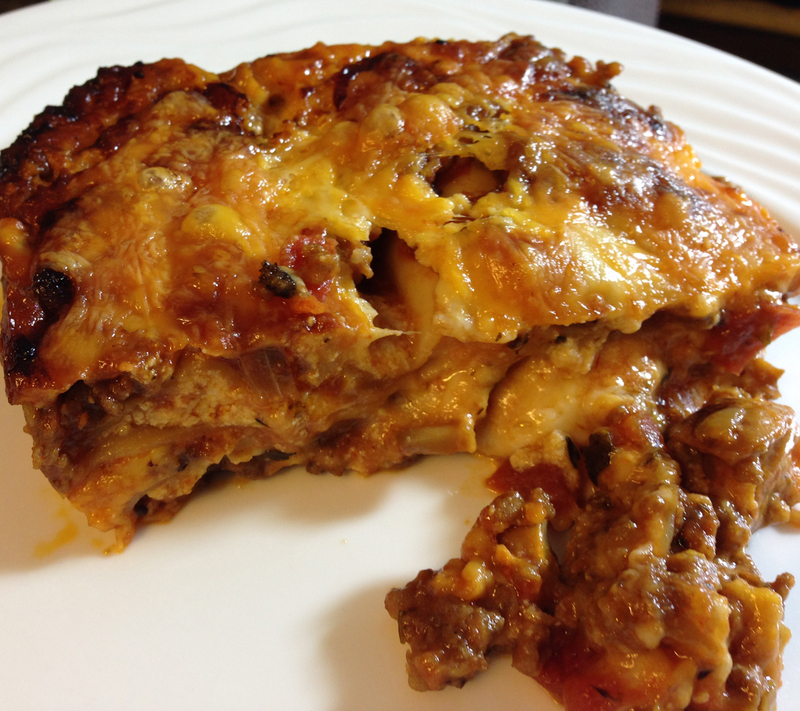 As with all recipes, I can think of things I want to try next time–a dash of this, a spoonful of that–but this is the radix, the omphalos, the groundwater source of Ilene’s wonderful, delectable, world-class lasagna. Caveat: This is not a health-minded recipe. It’s a heart attack on a plate. We don’t have it every week, or even every month. For us, it’s a once-, maybe twice-a-year treat, usually bookended by days of low-calorie meals and exercise for preparation and recovery. Once we accidentally (okay, I accidentally) bought Monterey Jack instead of mozzarella and, though it wasn’t as good, it was still quite good; the secret is the sauce…get that right and you can screw up a lot of the rest. Do not use low-fat/non-fat cheese for this; it’s not the same. 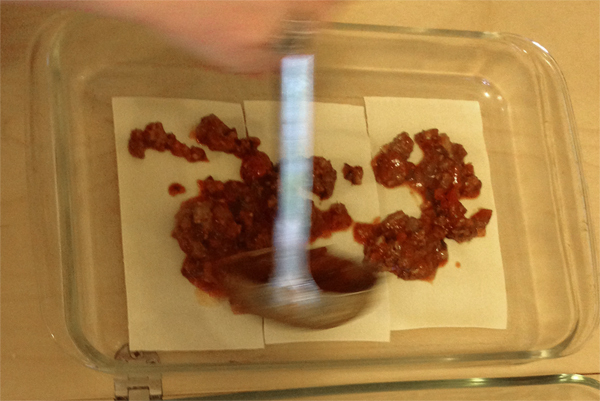 After assembling the lasagna (but before baking), the entire lasagna can be covered in cling-film and either refrigerated or frozen. They keep well in the freezer for a couple months. Just remember to take it out and let it thaw/come to room temperature before you bake it. Ilene tried for years to perfect this with boiled lasagna noodles, but they always tore during assembly, often came out mushy, and were always crunchy/chewy at the edges where they were exposed. Give it a go if you want, but the oven-ready/no-bake noodles cook to perfection in this lasagna, and are Ilene’s recommended method. I, also, and it’s really not hard to make. Sauce, assemble, bake. Easy peasy.